This 4-Star hotel gives credence to the notion that there is definitely more to Sapele Town than “Sapele Water.” Hampshire Hotel and Resort located at No 5/8, Miller Close GRA, Sapele, Delta, Nigeria presents a mix of style, grandeur and outstanding service delivery. It is an ideal getaway for the discerning leisure traveller. Guests are exposed to a wonderful hospitality experience with the rooms on offer within the categories of Classic, Deluxe Double and Executive Suite. 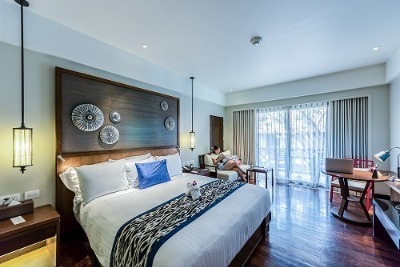 All rooms are well-appointed with tasteful interior décor and other in-room amenities such as comfortable king-size beds, flat screen TV, bedside reading lamps, air conditioners, mini refrigerators, sofas, work table, chair and in-room safety deposit boxes. All bathrooms are en-suite and fitted with bathtubs. Some rooms have a kitchenette. Hampshire Hotel and Resort boasts facilities such as an outdoor swimming pool with recliner chairs, Wi-Fi internet, a gourmet restaurant, an exotic bar, a thatched outdoor lounge and ample parking space for guests. Sports lovers can also have some fun on the lawn tennis and basketball court available on-site. Additional services rendered by Hampshire Hotel and Resort include laundry/dry cleaning services, safety deposit, room service, ironing and concierge services. The hotel also runs a business centre and maintains a well-manicured lawn for events. Q: Does Hamshire Hotel have free internet services? A: Yes, Wi-Fi internet access is free. Q: Does Hampshire Hotel have a swimming pool? Q: Does Hampshire Hotel have a restaurant? A: Yes, there is an on-site restaurant. Q: Does the hotel offer a space for events? A: Yes, there's a space on the premises available for events. Q: Does the hotel offer room service? A: Yes, room service is available. Hampshire Hotel and Resort is a budget hotel in Sapele, Delta. My experience was quite good, very clean hotel and I liked the fact that it was located in an isolated area and this made the environment very calm without any noise. It is also in a close right in front of a military camp which made the security quite assuring. The rooms were comfortable and I enjoyed the cable TV programmes. The restaurant served very nice meals and the staff services was prompt and very encouraging. The services rendered at the hotel were satisfactory. The room service was prompt and effective. The staff were accommodating and ever ready to meet my needs despite that my stay was short. The hotel had a really quiet and sane environment. It was nice staying at the hotel. Everything was fine. It was comfortable and I enjoyed every bit of my stay at the hotel. Their services are really good especially because one of their staff was responsive to all my requests. This made me enjoy my stay at the hotel. Have nice pictures of Hampshire Hotel and Resort?